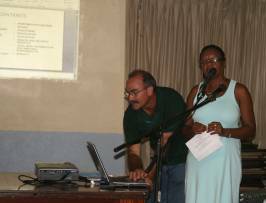 Roseau, Dominica – August 26, 2008……..Parliamentary Representative for the Portsmouth Constituency and Minister for Tourism, Hon. Ian Douglas, is pleased with proposals in a draft report on the future development of the town of Portsmouth prepared by the Portsmouth Citizens Planning Commission. Hon. Ian Douglas made the statement last week during a Town Hall Meeting between the citizens of the Portsmouth community and the members of the Portsmouth Citizens Planning Commission. After years of listening to ideas and suggestions from various groups and individuals about the needs of Portsmouth, Prime Minister, Hon. Roosevelt suggested that all those ideas should be collated and a development plan for the Town be prepared. Following several public meetings initiated by the Portsmouth Town Council and the Portsmouth branch of the Dominica Labour Party, the Portsmouth Citizens Planning Commission was established. The Commission comprises persons from the Portsmouth community with skills and expertise in the areas of law, agriculture, business, tourism, history, engineering and education. Headed by Historian, Dr. Lennox Honychurch, the Commission met weekly for six months and interviewed a wide cross-section of groups and individual experts in the preparation of a development plan. Studies and reports on the future development of Portsmouth helped inform the draft, including the Shankland and Cox report of the early 1970s. The thirty-two page (32) document contains a number of recommendations and ideas on the future development of Portsmouth. The report defines Portsmouth from Bell Hall at Douglas Bay in the north to Point Ronde in the south and extending eastwards into the hills behind. · The development of Portsmouth as a ‘Green City’. According to Parliamentary Representative for Portsmouth, Hon. Ian Douglas, the draft development plan for Portsmouth has been presented to the Ministry of Urban Renewal for its review. It is now expected that members of the Portsmouth Citizens Planning Commission will meet with the Ministry of Urban Renewal in the next few days. In the meantime the document has been widely circulated in Dominica and abroad for further input and discussion. Persons can communicate their comments and contributions on the draft document at portsmouthtowncouncil@yahoo.com. The final report according to the Commission must be accompanied by a concept design and zoning plan that will remain as a guideline for the development of Portsmouth for generations to come. The report will be submitted to Cabinet later this year.